It was when I was about 11 years old my aunt told us to buy a lotto. You might not believe this, in 1980's in Indonesia , lotto or togel (in bahasa), many people interpret their dreams into lotto codes. No idea who was the founder, but there was a book about dream and with numeric codes. It seemed to me the book was from China. A friend's brother of mine had a small lotto dealer, sometimes I shared my dreams with him to be interpreted into codes, and I enjoyed very much to break the codes together with him into a lotto numbers (although we didn't win at the end). That day my aunt bought a lotto based on her dreams. According to her, this time her dream would bring her luck as she dreamed about baby and moon. She was a bit addicted to buy lotto. Sometimes she won, but more lost than won, I guess. She promised to bring us to Ancol, a famous place for recreation located in North Jakarta. We went off to the lotto dealer where just a very very small dealer - they had only a very small table with some lotto tickets - we were very excited that our aunt would win. That time the lotto ticket was just about Rp 250. Aunt just bought three numbers. And that was her lucky day to win the lotto. I might need to tell you why I like posting about dreams. I studied Psychoanalysis subject few years ago, we were focusing in Sigmund's analysis, and you know how complicated his analysis was. However, I fond Sigmund's analysis even though it gave a big headache afterwards. Sigmund was very detail on his works, specially the interpretation dreams and he'd been working on this field for very long time. I had some books of his works and I must be honest with you that I did not finish reading his books as you need special time to read his books, and the interpretation dreams book was just soooo long and off course complex too. Anyway, it was because I always have dreams and remember them all! 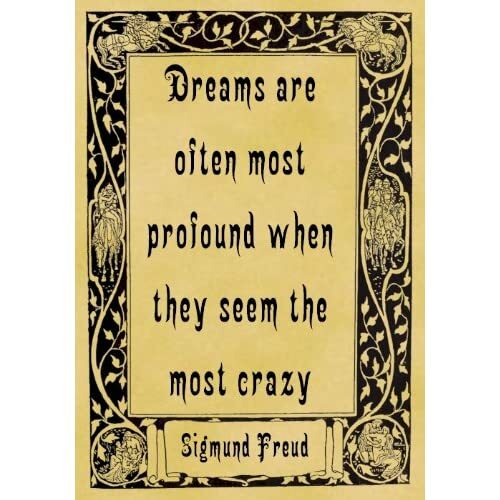 that's why I like Freud's work about interpretation dream and that's why I think why I like posting about dreams. To me it still does not make sense about a dream because dream could make you become something or being somewhere you haven't been to. We could fly like birds, fight like a hero, run so fast, meet people who have passed away, etc: have you ever had one of these dreams? My aunt believed that the baby symbolized happiness and the moon enlightened the earth from darkness. Relying on the book she discovered the drizzle of her dreams and got the number pattern. I like interpreting my dream sometimes but unlike my aunt I don't use the 'special' book and look for numbers. Usually when I dream seeing someone who already pass away I just take it as a reminder, that I need to visit her or his grave. Sometimes I dream seeing or talking to old friends, but again, I take it as a reminder to visit them. When I had a bad dream about someone's life I just think that person might be in a trouble OR sometimes I had a bad dream about myself and I just think I should not be thinking too much about something. Yeah, it's just as easy as that the way I interpret my dreams. I learn this from many people around - mostly people in Indonesia. It's not just Freud said that dream has a meaning, it's been said since old century people think that dream does have a meaning. Dream links to what happened in the past life and even the future. "Dream is just a dream" hubby commented to my opinion. Maybe he's right. For people who can't remember their dreams, what can they say about dreams? However, I still continue to crack the codes.